The first Islington parish workhouse may have been a house at Stroud Green hired by the vestry in 1726. In around 1731, a workhouse was set up on Holloway Road, near Ring Cross which was shared with Hornsey. A variety of other rented premises were used including one in 1758 on Lower Street near the chapel which may have been the old soap house or Ward's Place. The inmates performed spinning, oakum picking, and other tasks. The master and matron received £20 a year and board. In 1767, two rooms were added at the east side of the yard with another two rooms above them in 1772. A parliamentary report of 1776-7 recorded a parish workhouse in operation at St Mary's, Islington, with accommodation for up to 60 inmates. In 1776, the passing of a Local Act led in the following year to the erection a new workhouse for 120 inmates on land given to the parish by Mrs Amy Hill. It was located on "the Hundred Acre in the Back Road" — at the junction of Liverpool Road and what is now the western portion of Barnsbury Street. The three-story brick building consisted of a central section with two wings, and had a vegetable garden. It was extended at front of the centre in 1802, and the workhouse also had an infirmary. In 1814 there were 407 inmates: 95 men, 186 women, 67 boys, 48 girls, and 11 lunatics, with room for about 50 more. Male inmates picked oakum and mended local footpaths; females did slop-work and nursing. 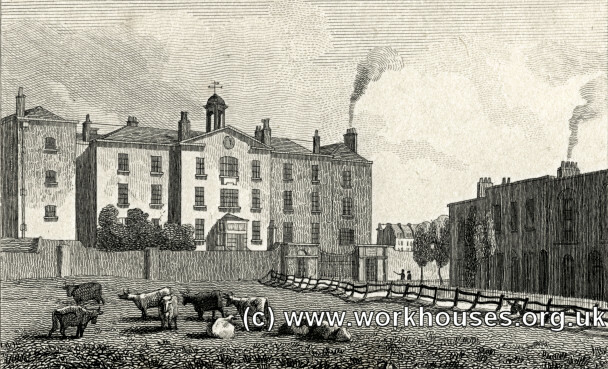 An 1819 view of the Islington workhouse. St Mary's, Islington, like a number of other London parishes such as St Luke, St Marylebone, St Pancras, and St Leonard's, Shoreditch, was constituted under a local Act of Parliament for the management of its own poor relief. Local Act status also made it immune from most of the provisions of the 1834 Poor Law Amendment Act. The 1777 workhouse, located at what is now the junction of Liverpool Road and Upper Barnsbury Street continued in use until the 1860s. The 1871 map below shows it that it appears to have been extended eastwards. The building at the corner may have contained a lodge and board-room. 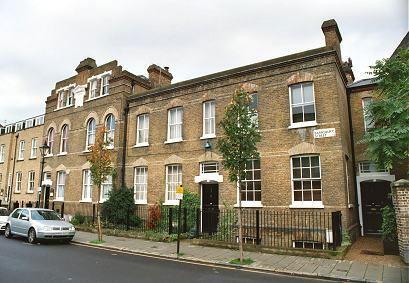 Islington Barnsbury Street frontage from the south-east, 2001. Islington from the east, 2001. The wards, low, small, and ill-lighted as they were, have yet an aspect of cheerfulness and comfort. The walls were coloured cheerfully; there were prints hanging on the walls, and a few ornaments about the fire-places. In every window were a few flower-pots or flower-boxes. The linen was very clean, for here two clean sheets are allowed per week. Every ward had a full supply of bed-rests for bed-ridden patients, who could thus be propped up in bed. 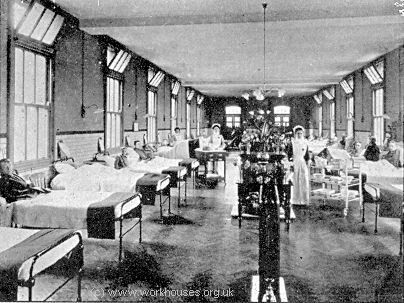 At the end of each ward was its clean and shining array of stomach and feet warmers for three or four aged and sick persons. Each ward had its proportion of shawls for the use of the sick in cold weather. The patients were very cheerful, very grateful, and much better kept as to their faces and hair, and their personal linen, than is often seen. In every case they had had their medicines regularly. The dressings were well applied. Sore backs were unknown as arising in the house, and we examined paralysed and speechless patients, who had been bedridden for years, and found them clean, comfortable, and with unspotted skin. Although the nursing was carried out by pauper inmates, they appeared to be experienced, well managed, and paid up to 1s. 6d. a week — all in all, what the Lancet felt able to describe as "the best side of parish nursing". On the more critical side, the midwifery ward was said to be "wretchedly cheerless; there is a want of chairs and arm-chairs; the walls are bare; the women were very unkempt; the bed-linen was unclean, and their personal linen in some instances filthy." It was noted that with regard to the tramps in the casual ward, "to bathe them is exceptional." The report also recorded that Islington had bought a 7.5-acre site at Upper Holloway on which they intended to build what the Lancet hoped would be a model establishment. The full text of the Lancet report is available on a separate page. In 1867, Islington was constituted as a Poor Law Parish under the 1834 Poor Law Act. 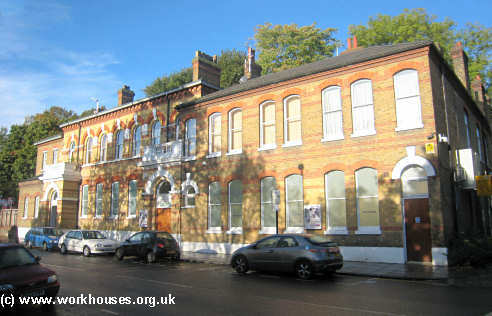 In 1869, its new workhouse was opened on St John's Road in Upper Holloway. After temporary use in 1871 as a smallpox hospital, the old premises were demolished and a new block containing a dispensary and relief offices was erected at the south-east of the site. The surviving buildings have now been converted to residential use. The St John's Road workhouse, erected in 1869-70 to designs by RH Burden, was T-plan layout typical of its time. Built of yellow brick at a cost of £63,300, it had a central section with administrative offices and Master quarters, with male inmates accommodated in the west wing and females in the east. A dining-hall with chapel over lay at the rear. An infirmary with four pavilion-plan blocks stood to the rear of the workhouse. A detailed account of the new building appeared in The Builder in June 1869. We illustrate this week the new workhouse for the parish of St. Mary, Islington, now in course of erection in Upper Holloway. The foundation stone was laid in July last by the chairman of the board of guardians. The site of the new workhouse, (which contains about seven acres and three quarters of land) is in the St. John's-road, and very near the Alexandra Orphanage. 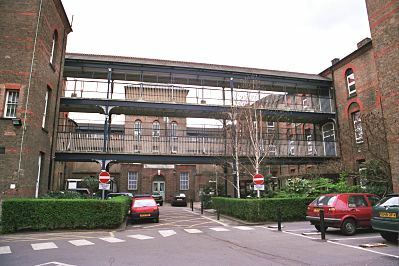 Being on "Hornsey Rise", the ground is very much higher in the rear than it is in front, a circumstance which has been turned to advantage by introducing a lower or basement story under the main building for stores, permitting further of the formation of a wide double terrace its entire length, which as a platform for the building, enhances its general appearance. The fall of the ground towards the front has facilitated the drainage, and a thorough system is being constructed with the view of rendering every part of the building and yard perfectly dry. Underground vaults for coal have been provided. The buildings externally are all of bright yellow stocks, relieved by bands and arches of red and white brick; Portland stone being sparingly introduced where other material would soon perish owing to the elevated and exposed situation. B. Porter's rooms and receiving wards. F. Dining-hall and chapel over. N. Doctor's residence and dispensary. Q. Yard closets and sheds. The main building possesses a frontage of about 420 ft., and a corridor 8 ft. in width extends its entire length on every story, communicating on either side with wards about 18 ft. 6 in. wide. It is proposed to obtain a proper classification of the inmates by means of iron gates and separate staircases at certain intervals. The entrance is in the centre, with a vestibule conducting to a principal staircase, behind which is placed the dining-hall, with the chapel over. The ground story of the main house will be 13 ft. 3 in. high in the clear and the one and two-pair stories 12 ft. each. The dining hall is 70 ft. by 45 ft., and 16 ft high, and the chapel will be finished internally in coloured brick, with an open-timbered roof. The infirmary, which is placed centrally in the rear, is on the pavilion principle, and will consist of wards 96 ft. long by 24 ft. wide, those on the ground floor being 13 ft. high in the clear, and those on the one and two-pair stories 12 ft high. They are lighted by windows on both sides extending to within 1 ft. of the ceiling, constructed in three heights, the two lower being double hung, the upper hung to hinges, opening inwards for ventilation. It is intended to warm the wards by the "Galton" stove placed in the centre, two to each ward, by means of which pure warmed air will be introduced ; the side walls will consequently permit of the uniform arrangement of the windows and beds. At the further end is a large window, which will contribute much to the cheerfulness of the wards, and at the same time assist the ventilation in connexion with louvres or fanlight over the door, which is at the opposite end. 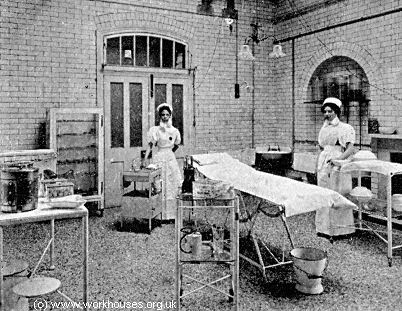 A nurse's room, with inspection window, and separate scullery, fitted with a small cooking-stove and washing sink, will be provided to each ward. Each ward will contain 32 beds, affording consequently between 850 and 900 cubic feet to each occupant. Two large day or convalescent rooms are provided, communicating with spacious airing grounds. The administrative block is placed centrally, and will consist of kitchen and scullery, apartments for the superintending matron, stores, and bedrooms in the upper part for the nurses. The "separation" wards form a detached building, consisting of ground and one-pair stories, similar in its general arrangement to the infirmary, but providing 1,200 cubic feet per inmate, and reached by means of an enclosed corridor from the infirmary. Access to all parts is provided by means of cartways up the two sides of the site, and enclosed corridors afford communication to every portion of the building under cover. Lifts will be provided in the several buildings. The right-hand front-wing building contains the board-room, with clerk's offices over, tradesmen's waiting room, also a large waiting-room, 70 ft. by 45 ft., and three offices for out-door relief. The corresponding building on the left hand contains the porter's lodge and rooms in connexion, two large receiving or probationary wards, each 25 ft. by 16 ft. and 12 ft. high, with attendants' room adjoining, ; also the casual wards, one of which is 50 ft. by 20 ft. and the other 55 ft. by 18 ft. 6 in. ; they are 14 ft. 6 in. high to the springing of the roof, and 21 ft. to the apex of the roof-light. 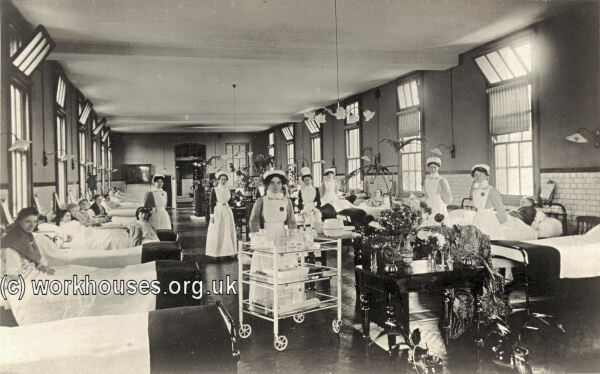 The beds for the casual wards will be after a design by the architect, and so arranged as to turn up bodily against the wall when not in use, leaving the floor clear for the purpose of cleaning. They are also very inexpensive as to cost. The buildings will be supplied throughout with hot and cold water, and warmed by ventilating grates and stoves in all wards and rooms, and by hot water in the corridors. Mr. R.H.Burden is the architect. The contractors are Messrs Nutt & Co., the contract amount being 63,300l. The engineer's work is being executed by Messrs. Jeakes & Co. The gas-fitting by Messrs. Faraday & Son. The baths are from Messrs. Rufford & Finch. The bells will be on the electric principle. Mr. Barrett's fireproof flooring has been used for the main corridors. Mr Lewis is the clerk of works. Islington St John's Road from the east, 1869. In 1905-6, perhaps because of shortage of space, batches of paupers appear to have been sent from St John's Road to reside at the workhouse at North Witchford in Cambridgeshire. North Witchford presumably had spare capacity from which the guardians were only too pleased to generate an income. Various additions were made to the buildings including receiving and casual wards in 1908. Islington St John's Road from the east, c.1910. 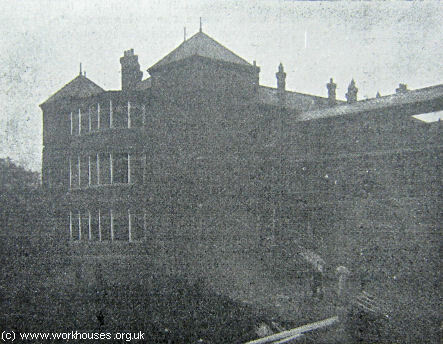 The former workhouse was taken over by the LCC and was known as Hillside. It closed in 1972, and all the former workhouse buildings have now been demolished apart from the former board-room and office at the north-east of the site. The remainder of the site is now occupied by housing and a park. Islington St John's Road former board-room and offices block, 2010. 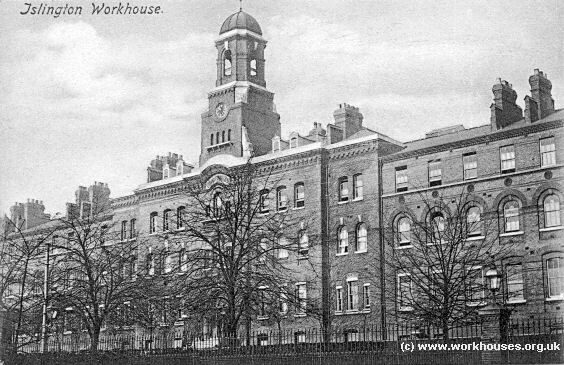 In 1898-1900, Islington developed a workhouse infirmary at a site on Highgate Hill, already occupied by the Highgate Smallpox and Vaccination Hospital. This hospital had been erected in 1848-50 as a replacement for an earlier smallpox hospital near Battle Bridge in St Pancras which was demolished as part of the King's Cross station development by the Great Northern Railway. 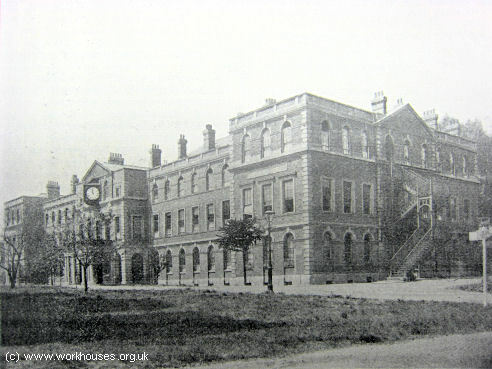 The new building, designed by Samuel Daukes on what was the a "green field" site, has 108 beds and continued in use until 1896 when a new and larger smallpox hospital was opened at South Mimms in around 1896. Highgate former smallpox hospital, 2004. 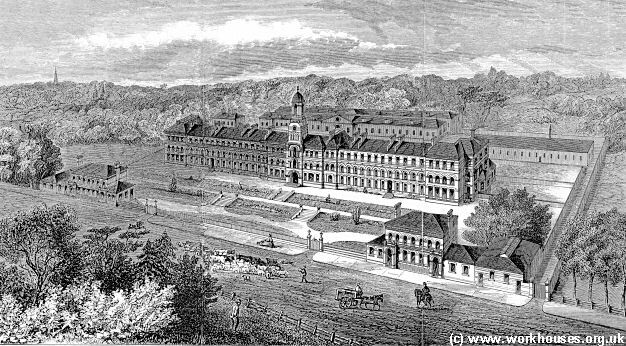 After the relocation of the smallpox hospital, the Islington Guardians acquired the Highgate site and built a large new 800-bed infirmary alongside the old buildings. The infirmary was opened on the 16th July, 1900, by the Duke and Duchess of York, on what was the hottest day of the year with a temperature of 92 degrees in the shade. In his speech, the Duke noted that Islington was the largest parish in the country, numbering 340,000 people. Islington Highgate Hill Infirmary site, 1913. 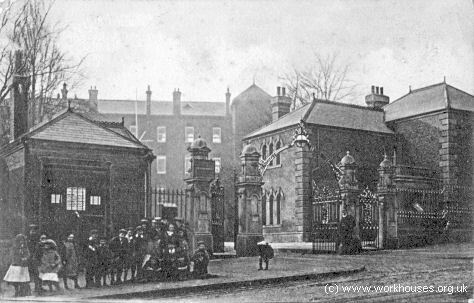 Highgate Hill Infirmary entrance from the east, c.1904. Designed by William Smith of Chancery Lane, and built by Kirk & Randall, the new building was a late example of the pavilion-plan layout popular between about 1870 and 1910. It comprised a central administration and service block of two or three storeys, connected by a long corridor to four double ward pavilions 100 feet apart. Because of the site's slope, the ward blocks were four storeys high at the south but only three at the north end. The connecting corridors were enclosed on the first two floors but open on the two upper floors. There were also open iron galleries for fire-escape purposes connecting each pair of wards. Bathrooms and lavatories were placed in small annexes on either side of the wards, with the ends of the pavilions being used to provide small day rooms. Ancillary buildings such as the laundry, mortuary and coffin store were located at the rear of the old smallpox hospital, which itself provided a nurses' home and office accommodation. The home was linked to the pavilions by a subway. 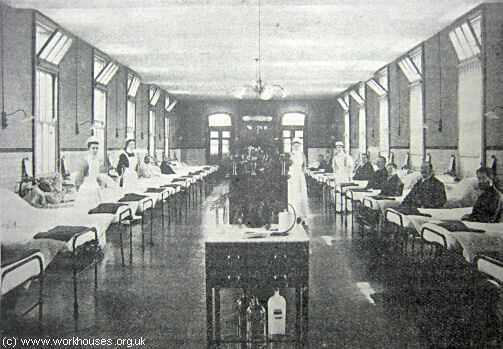 Highgate hospital nurses' home, c.1905. Highgate Hill Infirmary from the north-west, 2004. The large bridges connecting the pavilion blocks' upper floors could be used for the open-air treatment of tuberculosis patients. 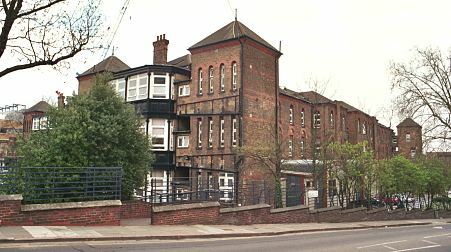 Highgate Hill Infirmary from the south, 2004. Highgate Hill ward block, c.1905. Highgate Hill theatre, date unknown. Highgate Hill male ward, date unknown. Highgate Hill male ward, c.1905. Highgate Hill female ward, date unknown. In 1930, control of the site passed to the London County Council and it was renamed St Mary's Hospital. By 1945 it had become grouped with the adjacent Highgate Hospital (former St Pancras parish infirmary) and Archway Hospital (former Holborn Union infirmary) under a single administration. With the advent of the National Health Service in 1948, the three sites became the St Mary's, Highgate, and Archway wings of the Whittington Hospital. 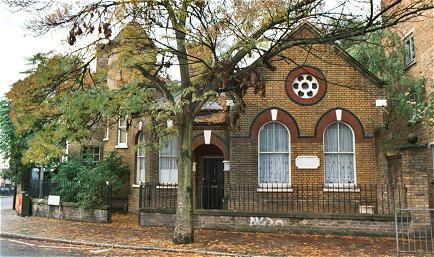 In 1853, Islington erected an infants' school on Porter's Acre at the east side of Hornsey Road. It had places for 90 boys, 60 girls, and 30 infants, with room for further expansion. Boys and girls were taught separately but had a common dining-hall. There were also infirmaries and accommodation for a master, schoolmaster, and schoolmistress. In 1864, the school contained 111 boys and 75 girls. The school was enlarged in 1871 with accommodation for an extra 12 pupils, together with industrial trainers. In the same year, the school was described as 'a sort of juvenile workhouse' where 95 boys, 86 girls, and 72 infants were clothed and taught. The pupils were said to be inferior in intelligence to street children, and instruction suffered because the master had too many duties, and the infants had no regular teacher. The girls had been doing nothing for seven weeks except preparing clothes for older girls who were about to emigrate. In 1877 some children kept in the old workhouse were transferred to Hornsey Road. Extensions were added in 1879 and 1885, and the average number in the school during the 1880s was 363. 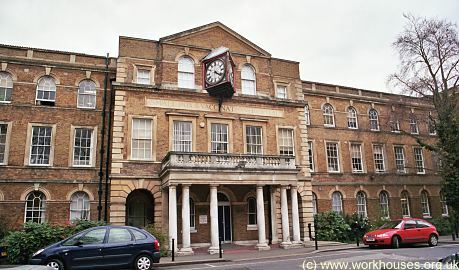 In 1930, the School was transferred to the control of the London County Council and renamed the Andover Children's Home. However, it was closed in around 1933. Islington established a children's Receiving Home at 59 Hornsey Rise, Islington. The home, which could accommodate up to 74 children, processed those newly arriving into the parish's care. The building no longer exists. 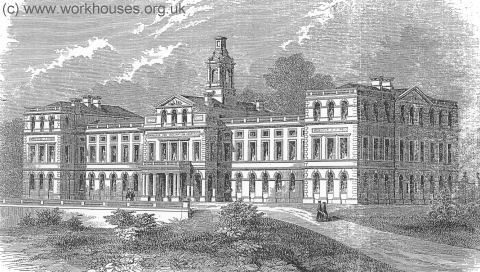 From 1849-1855 the parish ran an infants' poor establishment at Park House, in Hackney, after which the children were transferred to no. 5 Colebrooke Row. In 1882, Islington took over the former West London workhouse site on Cornwallis Road (formerly known as Shadwell Road). In 1893, the Guardians leased Bowes Park in Edmonton, where they housed around 20 old men until 1897. General records — Guardians' minutes (1867-1930); Committee minutes (1874-1930); etc. Liverpool Road Workhouse — Admissions and discharges (1840-72); Births (1839-67); Deaths (1839-67); etc. St John's Workhouse — Admissions and discharges (1866-1931); Creed registers (1869-1930); Births (1867-85, 1891-1933); Deaths (1867-1933); Baptisms (1880-1932); etc. Bowes Park Workhouse — Admissions and discharges (1897). Shadwell/Cornwallis Road Workhouse — Admissions and discharges (1885-1915). The Hospital on the Hill: The Story of Whittington Hospital. Whittington Hospital History Project, 1985. A History of the County of Middlesex: Volume VIII: Islington and Stoke Newington parishes (OUP, 1985).